With Mountain views so spectacular, you’ll be eager to share them. Thankfully, this fabulous country estate on 3.09 acres was built for entertaining, both inside and out. Upon entry, a gorgeous covered front porch welcomes you and offers an idyllic spot for appreciation of the panoramic views. Inside, a formal entry leads into the main living, dining, and kitchen area. With dark wood cabinetry, gleaming white appliances, a large island, and breakfast nook, the kitchen is great for gathering. The formal living area contains a handsome gas fireplace and a well-appointed wet bar. Elsewhere on the main floor, the master suite awaits with an additional gas fireplace and full ensuite bathroom with heated tile. Three additional bedrooms exist on the upper level, including a second bedroom suite to impress the most discerning of guests. Further, located over the shop, a two bedroom suite with bright and white kitchen, balcony, and spacious living area with gas fireplace. Outside, a gorgeous courtyard leads to a covered outdoor living space with fireplace and incredible views. Formal entryway with great closet space. Gourmet kitchen with dark wood cabinetry and large island. Living room with gas fireplace and wet bar. Main floor master bedroom with gas fireplace and heated tile in full ensuite bath. Three additional bedrooms on second level, including a second bedroom suite. Sitting area on main floor with gas fireplace. Two-bedroom suite above the 4-bay shop, with full kitchen and living area with gas fireplace. Breathtaking lake views from multiple points on property. Large covered porch on front of home, great for morning coffee. Covered outdoor living area with gas fireplace and wet bar. 4-Bay shop on property with full RV hookup behind the shop. 3.09 acre lot with breathtaking lake views and wonderful spaces for gathering. 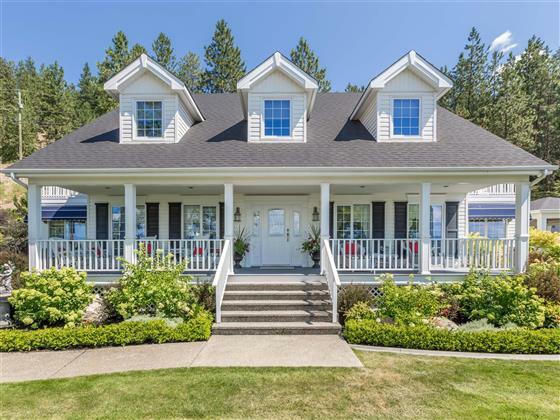 For a private viewing of this gorgeous country estate on 3.09 acres, call the Salt Fowler Team today at 250-549-SALT (7258) and "Just Add Salt"!